Step into the world of pure networked IP audio. The IP-12 control surface with IP88CB BLADE engine is the perfect entry into audio-over-IP networking for small to medium sized radio operations. This console is self-contained with all the faders and access to sources you’ll need, plus has room to grow due to its modular construction. 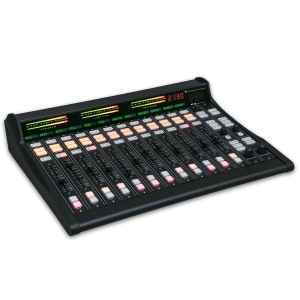 The IP-12 is a 12-fader control surface that taps into the power of the WheatNet-IP Intelligent Network through its IP88CB console audio BLADE engine to make a perfect low-cost, small-footprint solution for any studio. Each of its 12 input modules is equipped with an LED source name display and an A/B source selector; sources can be set via a rotary encoder in the master section. Each input module has access to four program busses and has cue and talkback switches. A 100mm long-throw fader and lighted channel ON/OFF switches round out the module. 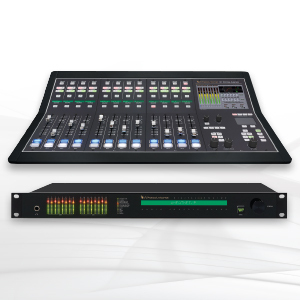 The IP-12 control surface connects via Ethernet to its audio engine, the Wheatstone WheatNet-IP ip88cb console audio BLADE. A powerful 1RU device containing the console’s digital signal processing, input, output, and logic circuitry, the engine has no fans and may be located either next to the console or at a remote location.The master section offers control room, studio, and headphone controls with source selection, and an onboard headphone jack and amplifier. 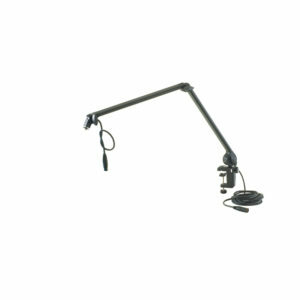 Timer controls, a master talkback button, and a built-in cue speaker with volume control are provided. There are four event switches and six programmable buttons available for user functions. The meter bridge has three stereo pairs of bright 30-segment horizontal LED bargraph meters, as well as an onboard timer with controls located in the master section.